Chelsea star, Eden Hazard, has denied claims that he has agreed on a blockbuster five-year deal with thirteen-time European champions, ​Real Madrid. The Belgian winger's Chelsea deal comes to an end at the end of next season, and the player is yet to sign an extension. Knowing Hazard's qualities and the impending transfer ban, Chelsea are naturally desperate to keep hold of the player. Hazard, however, has continued flirting and has reiterated his intention of playing at the Santiago Bernabeu time and again. Zinedine Zidane's return to the helm has escalated the rumours even further. Hazard has always been a vocal admirer of the Frenchman and said he would love to train under the three-time Champions League winning manager. Reports emerged this week that the 28-year-old had agreed to join Real Madrid after speaking directly to their head coach Zinedine Zidane. 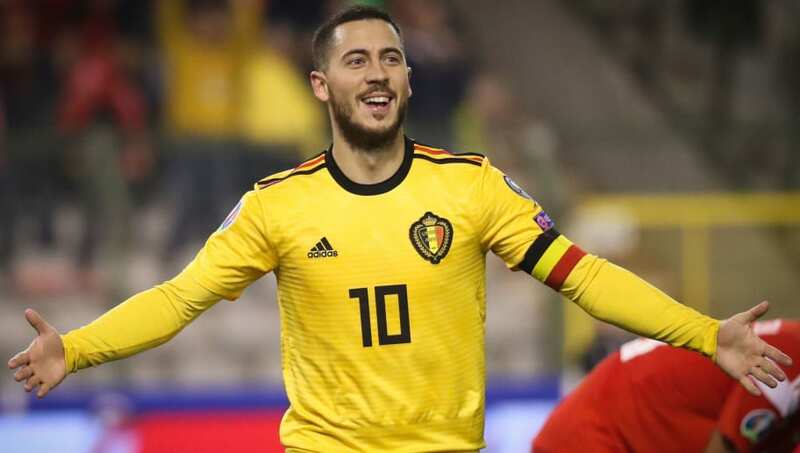 The Chelsea number 10 is currently on international duty with his country Belgium and, when asked about the Real link on Saturday, he shot down the rumours with a smile on his face: "There's nothing in the reports," as quoted by Sky Sports. According to reports, the Blues rejected a bid of around £60m for Hazard earlier this month, as they feel their talisman is capable of fetching a lot more. Madrid are planning to sign West Ham United's Felipe Anderson if they fail to sign the Belgium international.